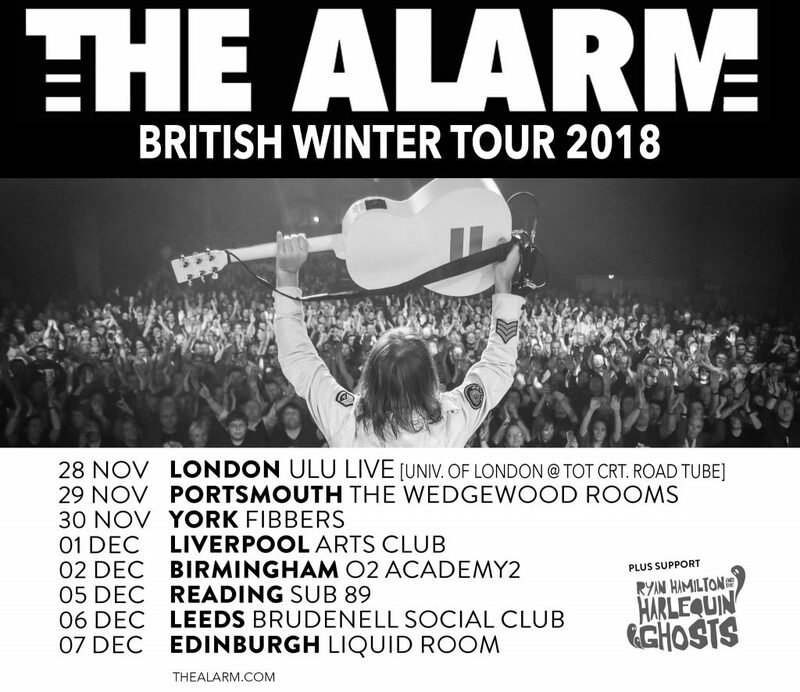 After a triumphant tour of North America (see reviews below), The Alarm return home to the UK for their British Winter Tour 2018, with special guests Ryan Hamilton and the Harlequin Ghosts. Beginning with an opening night at the University of London Union, in Central London on November 28th, the tour will visit 8 British cities concluding with a final date of the year at the Liquid Rooms in Edinburgh. Book your advance tickets now. PITTSBURGH = “The Alarm, demonstrated it’s still got an anthemic, stadium-sized sound”. Since the June 26th release of new, acclaimed album EQUALS put the band back in the charts on both sides of the Atlantic, The Alarm have been performing non-stop, including an impromptu Beatles-style rooftop concert from Live Nation’s New York City HQ on August 6th, that was broadcast live on Facebook and attracted over 100,000 views. During the broadcast, singer Mike Peters announced that The Alarm would be taking part in the Love Hope Strength Foundation’s Rock The Canyons event this October 14t – 21st and performing at a concert deep inside the Grand Canyon with special guests Billy Duffy (The Cult), and Robin Wilson (Gin Blossoms). (If interested in taking part LHS has a few spaces left to fill and details can be found here). The Alarm have also announced plans for their Third Annual US Gathering which will take place at New York’s Gramercy Theatre and Irving Plaza over the weekend of April 12th / 13th 2019. While the band’s North American Tour has been extended from 27 to 44 dates as a result. The band’s latest album EQUALS continues to pick-up positive press and airplay with current stand-out track, BEAUTIFUL receiving extensive airplay at radio stations all across the UK and USA and currently at Number 8 on the Friday Morning Quarter Back US Radio Chart and at Number 12 on the College NACC Radio Chart. The US connection will follow The Alarm into the UK Tour with the addition of Texan band Ryan Hamilton and The Harlequin Ghosts performing at all shows. By the time of the London show at ULU on November 28th, Mike Peters and The Alarm will have been abroad for a long time and are excited to return to the UK to perform for their legion of British fans. “The American Tour has been really exciting with lots of the shows Sold Out in advance”, states Mike Peters, “Performing tracks from EQUALS has brought a new energy to our concert performances and we can’t wait to bring it all home to the UK this winter”. Based near Fort Worth, Texas, singer/songwriter Ryan Hamilton released his first solo album, the critically acclaimed ‘Hell of a Day’, back in 2015. February 2017 saw the album ‘The Devil’s In The Detail’ released under the name ‘Ryan Hamilton and the Traitors’, hailing the introduction of band mates Mickey Richards on Drums and Rob Lane on bass. 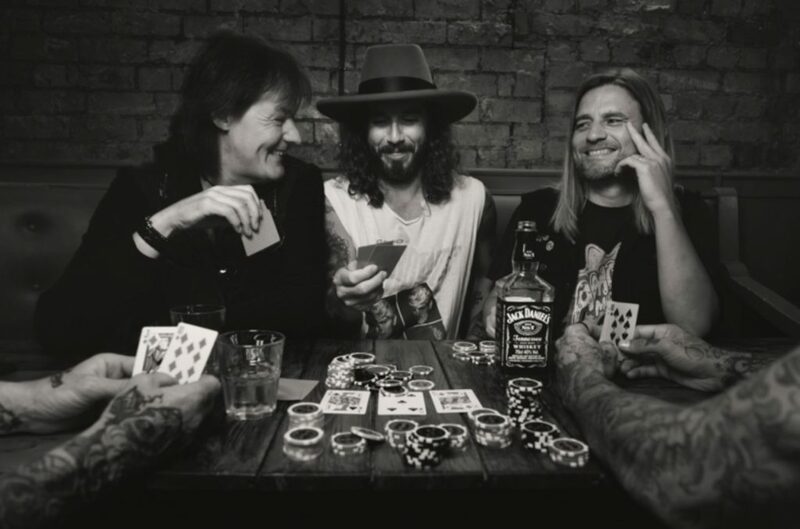 Charity single (for Samaritans) – ‘F**k You Brain’, written & recorded with Ginger Wildheart, who they had previously toured with, brought the band to the attention of Little Steven’s Underground Garage (Sirius XM). This led to the band signing to Steven Van Zandt’s ‘Wicked Cool’ label in June 2018 as Ryan Hamilton and the Harlequin Ghosts. New music is coming from Ryan Hamilton and the Harlequin Ghosts on Wicked Cool, October 2018.